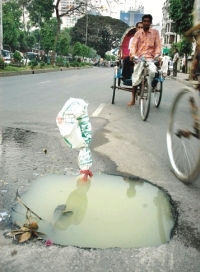 A polythene bag tied to a stick is the only sign that warns of an open manhole on a road near Gulshan-1 in the city. The lid was stolen months ago and the manhole now spreads unbearable stench. Besides, sewerage water floods the road with passing vehicles spraying the filth. London from March 13 to 25 to find prospective buyers for the bank. Commission Chairman Enam Ahmed Chowdhury led the delegation. Around 20 buyers showed interest in buying the bank. The government is working out the privatisation process to complete it by September. The privatisation process will include waiving existing restrictions on the number of expatriate management staff. About branch rationalisation, sources say majority shareholder (buyer) will have management control over all aspects of the bank's operations, including human resource policies and pay scales. The government will not impose any restrictions on those. The bank's pension liabilities will all be taken care of by the government from its own funds. The highlight of this year's Independence Day parade included the achievements and works of the different ministries. Trucks decorated with large, colourful posters depicting 'successes' of the BNP-led coalition government, now in the last year of its term, drove slowly past hundreds of invited guests at the National Parade Square. There were also dramas of Rapid Action Battalion's (Rab) operations against militant chief Abdur Rahman and Bangla Bhai set up on trucks. Organised by Nine Infantry Division, the parade was broadcast live by state-run Bangladesh Television. It is interesting to note that though the recorded voice of late president Ziaur Rahman proclaiming independence was played, parts of it were cut out, namely the statement "On behalf of Bangabandhu Sheikh Mujibur Rahman", the words that were in the original proclamation. A special publication titled 'Great Independence and National Day Parade 2006' was brought out on the occasion. In the preface, Ziaur Rahman's role in the Liberation War was lauded as the proclaimer of independence while nothing about any other leaders, even Bangabandhu Sheikh Mujibur Rahman, was mentioned. On March 27 the Supreme Court issued a suo moto contempt rule against Chief Election Commissioner (CEC) MA Aziz and BNP lawmaker Nurul Islam Moni for annexing a letter that apparently expressed "no-confidence on apex court" of the country along with the leave to appeal filed by the Election Commission against the High Court judgment over preparing electoral roll. The full bench of the Appellate Division chaired by Chief Justice Syed JR Mudassir Hussain ordered the CEC and the ruling BNP lawmaker to show cause by April 9 as to why contempt proceedings should not brought against them. The chief justice also said the CEC's leave to appeal petition against the High Court's January 4 directives on voter list will remain adjourned until disposal of the contempt issue. The next hearing on the matter will be held on April 9. 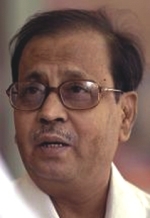 Nurul Islam Moni, also chairman of the parliamentary standing committee on Science and Information and Communication Technology Ministry, on February four sent a "confidential and urgent letter" through a special messenger to advocate Khodoker Mahbubuddin Ahmed, MP, chief council for the Election Commission. 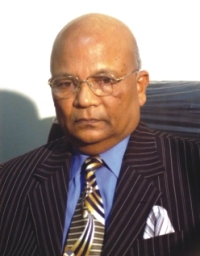 In the letter Nurul Islam Moni stated that Dr Allauddin Ahmed, a law maker of opposition Awami League, commented in advance to him (Moni) at a talk show on satellite channel ATN Bangla, that CEC Justice MA Aziz would have to leave the Election Commission (EC) after February six, the date scheduled for hearing on the leave to appeal filed by the EC against the High Court judgement over preparing the electoral roll. The Election Commission, on February five, annexed the letter along with its leave to appeal and filed a supplementary petition in the Appellate Division to stay the hearing and defer the date for hearing the case in the full court of Appellate Division. The hearing of the case was adjourned five times due to quorum crisis of judges in the Chief Justice's court. On March 12 the Appellate Division fixed March 27 for hearing the case. And once the matter came for hearing the court asked advocate Khondoker Mahbubuddin Ahmed why the EC has annexed the letter along with the leave to appeal and whether the EC and sender of the letter have confidence on the Supreme Court. Advocate Khodoker admitted that they had full confidance on the Supreme Court and the letter was annexed along with the leave to appeal application since the matter was of public importance. The court adjourned the hearing for half an hour and then issued the contempt rule against the CEC and Nurul Islam Moni. Veteran communist leader and politburo member of Communist Party of India (Marxist-- CPIM) comrade Anil Biswas died last Sunday at a hospital in Kolkata. He was 62. Comrade Biswas also headed the state branch of the CMP in India's West Bengal (WB) state, where the party is expected to win the next general elections. If that happens it will be for the seventh time in a row that the communist-led Left Front will come back to power. He and fellow Marxists in WB withstood the break up of Soviet Union in the early nineties. In fact, in the local government body elections that followed, the CPIM beat rivals by an overwhelming margin. Thousands gathered in the state's capital Kolkata to pay homage to the deceased leader. In keeping with Bisaws's last wishes, his body was handed over to Nil Ratan Medical College Hospital. "Anil Biswas set an exemplary standard in adhering to Marxism-Leninism and applying it creatively to the development of the movement and Party. He led a simple life and his whole time and energies were devoted to Party work," the CPIM says in a press statement. Comrade Anil Biswas is survived by a daughter.